A Supreme Court Fight For The Rights Of (Frequent) Fliers What rights do participants in an airline's frequent-flier plan have to their miles or points? That's the question before the U.S. Supreme Court on Tuesday, when the justices examine whether, and under what circumstances, frequent fliers can sue in these disputes. Rabbi S. Binyomin Ginsberg sued Northwest Airlines for what he says was unfair termination from its frequent-flier program. His case goes goes before the Supreme Court on Tuesday. Do airline frequent fliers have any legal rights when they get into disputes over their club memberships? That's the question before the U.S. Supreme Court on Tuesday, when the justices examine whether, and under what circumstances, frequent fliers can sue in these disputes. Frequent-flier programs — famous for their free trips, upgrades and goodies — are also infamous for what some members view as arbitrary airline behavior. Take the case of famed concert cellist Lynn Harrell, expelled from the Delta frequent-flier program, as reported on the Colbert Report. Delta kicked Harrell out because he always travels with his cello and pays for a separate seat for the large and very valuable instrument. Indeed, Harrell travels so much, and internationally, that he got a frequent-flier card for "Cello Harrell." Delta didn't like that, telling Harrell he was violating the rules. Not only was the cello chucked out of the program, so was the human Harrell. His miles were also confiscated, and he was barred from ever enrolling in any Delta Sky Miles program in the future. Harrell's situation may have been a laughing matter on Comedy Central, but some other folks who get cross-ways with the airlines view their disputes as matters that should go all the way to the Supreme Court. Rabbi S. Binyomin Ginsberg, an educational consultant and lecturer, was cut from his frequent-flier program for, according to Northwest Airlines, complaining too often. Complaints over late luggage, lost luggage, long delays on the tarmac and so on. According to Ginsberg, he never complained to flight attendants, gate personnel or pilots. Instead, he started at the top. "I did exactly what they asked you to do," Ginsberg said in an interview with NPR. "If you have a negative experience, they want you to give them feedback." And so he did — a lot. According to Northwest, he called the frequent-flier program 24 times within seven months to register what the airline viewed as complaints. Ginsberg was a very frequent flier, with top Platinum Elite status and approximately 75 flights a year. He says he never asked for anything when registering his complaints. The airline contends he "repeatedly asked for compensation." Whether asked for or not, the airline tried to soothe the unhappy flier. In 2007, Ginsberg was awarded nearly $2,000 worth of travel vouchers, 78,000 in bonus miles, and $491 in cash for a lost bag. But then Ginsberg was notified by telephone that his frequent-flier status was being terminated because he had "abused it." Ginsberg says that the agent told him he was "no longer a member of our frequent-flier program," that his miles had been confiscated, and that he would "never be able to join the program again." Ginsberg says he thought it was a joke at first. But when he realized it wasn't, he asked for an explanation. "And they said, 'Because you complained too much about our service,' " he says. When he called the legal department to follow up, he says he was told that under federal law the airline has "total discretion" in such matters. "I said, 'You know what, you're forcing me to take legal action,' " Ginsberg says, "and she started laughing, literally," telling him, "'You know, you're not the first person who has threatened that, and we don't get scared of that.' "
And so, Ginsberg did what any red-blooded American would do. He sued the airline for himself and others similarly situated, asking for $5 million in damages. 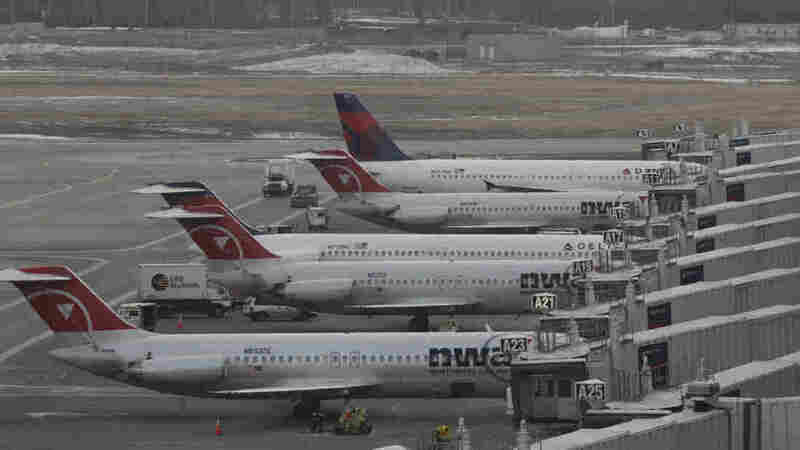 Nobody outside the airline industry seems to know how many people have had their frequent-flier-club memberships revoked, but on Tuesday, Ginsberg's case will actually be before the Supreme Court. The legal issue is more esoteric than the nitty-gritty of frequent-flier points. Federal law gives the federal government the power to regulate most disputes over airline routes and services. Therefore, for example, the Supreme Court ruled in 1995 that consumers could not sue American Airlines for retroactively changing its frequent-flier program (like United and Delta did this November). But the court left open what it called "routine breach-of-contract claims," where customers assert they are trying to make the airlines live up to their agreements. In Ginsberg's case, the Northwest contract provided that the airline could terminate membership in the frequent-flier program at any time if it believed in its "sole judgment" that a member had abused the program. Ginsberg contends that he did not abuse the program, and that the airline revoked his membership without valid cause; essentially that the airline, in terminating his lifetime membership, was not acting in good faith within the reasonable expectations of the agreement. Northwest, however, says Ginsberg's "reasonable expectations" are not reasonable and that he is attempting to make the agreement more expansive than it actually is. Now the Supreme Court will decide, and frequent fliers everywhere will be watching.